When planning a trip to Belize, it's easy to get overwhelmed by all the sights and activities this tropical location has to offer. However, one of the most unique opportunities Belize provides is a chance to explore various Mayan ruins spread throughout the country. While many ruins are located on private lands, several are open to the public, with the Corozal district being especially rich in archaeological sites. 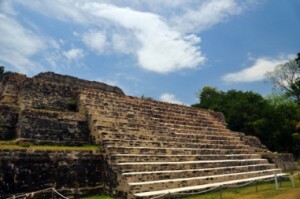 There are two main Mayan sites in the Corozal area: Cerros and Santa Rita. Cerros is located just across the water, and marks what used to be a major coastal trading center. The remaining ruins seem small when looking across the water, but up close the remaining pyramid is actually quite large at approximately 70 feet high. While much of the rest of the site is now under water, you can still hike to the top of the pyramid for an incredible view of the surrounding area. Santa Rita is just on the outskirts of town, and marks the potential site of the ancient city of Chactemal. Another trading center, Santa Rita is actually underneath part of Corozal. However, archaeologists have excavated a small temple site over the years located just across from the Coca-Cola plant. The area has many other archaeological sites, but the majority are either not excavated or sit on private lands. Beyond the Mayan Ruins, this district offers various other activities and attractions, whether you're just visiting the area or looking at the district as a potential place to move to or retire. For example, two nature reserves are located nearby, including the 22,000 acre Shipstern Nature Reserve and the Bacalar Chico National Park & Marine Reserve. These reserves provide ample opportunities to see everything from tropical birds to crocodiles and manatees. If you enjoy snorkeling or scuba diving, the surrounding area provides several opportunities for viewing sea life, especially near the Bacalar Chico reserve. You can get to the Corozal District three main ways: bus, boat or plane. Buses run from areas like Belize City several times daily and are the most inexpensive method of travel in the area. If you're staying in San Pedro on Ambergris Caye you can travel by boat on the Thunderbolt, or to and from other coastal cities by hiring a boat down near the docks. Flights are available through Tropic Air between San Pedro and the Corozal area on a daily basis, but only if there's enough demand for them to take off. While not typically at the top of many lists as far as places to explore, the allure of this district's quaint stilted frame houses spread across a charming seaside town can be irresistible. Mix this atmosphere with the history and culture of the surrounding areas, and you'll find Corozal to be a worthwhile stop while in Belize. A guide to the Corozal District of Belize, including archaeological sites and other attractions.